North is up. The original framing was "portrait" because I was chasing nebulosity towards the south, but that was too faint and I decided to show you only the top half (actually a bit less than half) of the Canon 20D frame. Full frame is shown at the bottom left corner. 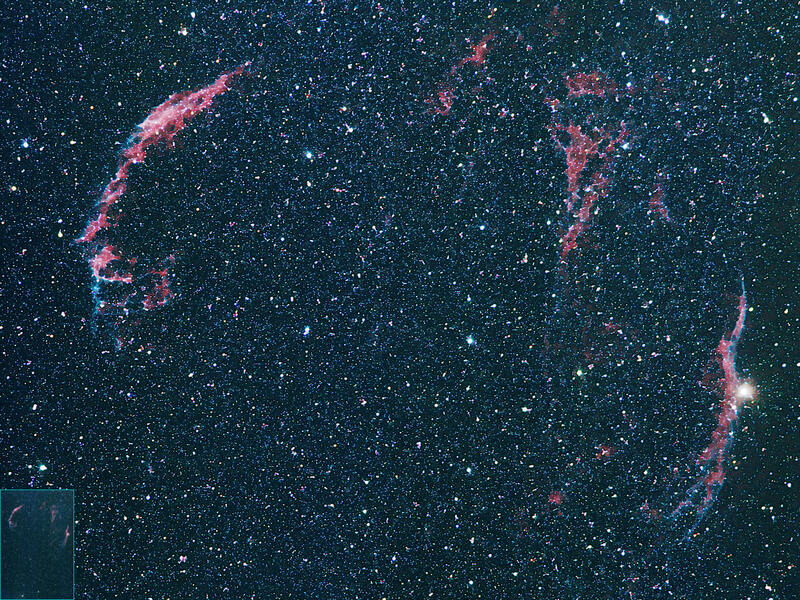 This is a supernova remnant in Cygnus, but since it spans quite a large expanse of sky, about 5 Moon diameters, it was initially thought to be 3 distinct nebulae, given different identification numbers, and 3 different names, Network, Cirrus and Veil respectively, going from left to right. To confuse matters further, the names Filamentary Nebula and Lacework Nebula are also thrown in. This is a very rich part of the Milky Way with a very dense starfield. To fully appreciate the nebulae one ought to use narrowband filters. Click "next" for more images from the same night, also details of the shooting set-up. Can you give me an idea what you do for post processing on a shot like this?